Travelwheels campervans always has some cheap campervan hire specials for Campervan Hire Australia 5 person campervans. Everything is included in the price with Travelwheels! 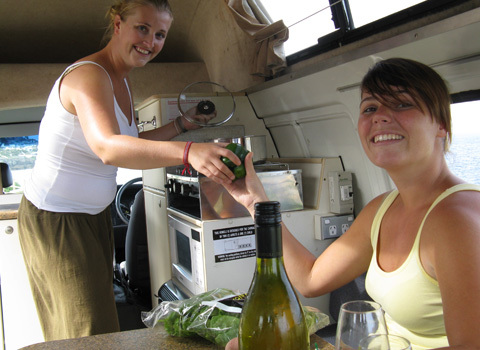 Check out travelwheels campervan hire Australia deals here! Travelwheels campervan Hire Australia 5 Person campervan specials, below are the main features that are included when you hire 5 person campervan from travelwheels. The 5 person Camper is the cheapest choice if you want to travel in a group. It seats five people in comfort and sleeps three inside. We provide a two man tent for the two extra people free of charge!. Front Cabin seats 3 people + 2 side-facing seats in rear. Five safety belts (2 x 3 point lap sash belts, 3 x 2 point lap belts). Bed 3 = Free 2 man tent included for flexible sleeping options – handy if someone snores! Travelwheels 5 person campervan comes with everything you need for good value campervan-hire in Australia. You will not get a cheaper way for up to five people to travel and still have decent facilities such as 55 Litre fridge, sink, cooker, water tank, Air conditioning, power steering and all the sleeping bags, tents and cooking equipment included in the price! We even throw in five camping chairs for free! 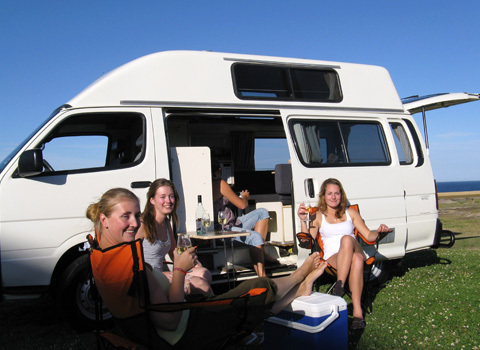 For great deals on 5 Person Campervans for rent across Australia Contact travelwheels in English, Deutsch or Français. Our friendly staff are all travellers or people who have emigrated to Australia. We have staff from German, Austria, France and other European countries so we will answer any questions you may have about camper-hire Australia in English, Deutsch or Français. TravelWheels Campervan hire Australia Specials! These travelwheels 5 Person campervans for hire are unbeatable value for money and definitely the best way for 5 guys to travel around Australia on a budget in a camper. If you can find a cheaper deal that this, then simply email us the competitor quote and we will guarantee to beat it for Sydney to Sydney campervan hire. NOTE – camper must be similar specifications, age, style and not a beat up old banger!